Decline in prices on account of increasing competition, rising consumer awareness and adoption across schools, colleges, and commercial offices have increased the demand for Interactive Whiteboards (IWB) in India. Additionally, growing parental awareness for dynamic interaction has buoyed the need to avail interactive whiteboard solution in education application including schools and colleges in India. 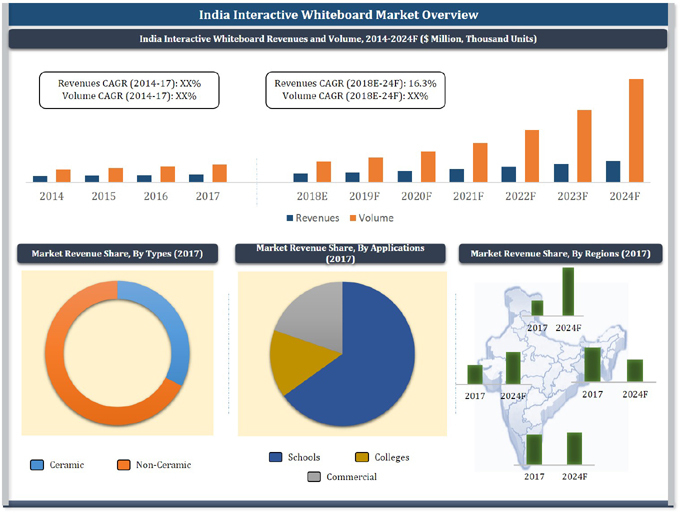 According to 6Wresearch, India Interactive Whiteboard market is projected to grow at a CAGR of over 16.3% during 2018-24. Over the past few years, IWB market experienced rising consumer awareness towards the adoption of these solution, especially, across education and commercial applications. IWB solution is steadily replacing the conventional whiteboard teaching solution on account of certain key advantages such as better communication and ease of explanation of the concepts. In 2017, the Southern region accounted for largest revenue share of the India IWB market, followed by the Northern region and others. The region is majorly driven by surging adoption of IWB in school segment; higher stress on education and rising awareness for teaching aids solution in parents are the key driving factors of the market. Some of the major players in India Interactive Whiteboard market include- Hitachi, Smart Technologies, Visual Display, Title Display, Globus Infocom, Supreme Global, and Sharp. The report thoroughly covers India interactive whiteboard market by types, applications and regions. The report provides an unbiased and detailed analysis of the on-going trends, opportunities, high growth areas and market drivers which would help the stakeholders to device and align their market strategies according to the current and future market dynamics. 12.4	Visual Display Solutions Pvt. Ltd.
12.5	Digital Info Media Pvt. Ltd.
12.6	Title Display System Pvt. Ltd.
12.9	Supreme Global Trading Pvt. Ltd.
India Digital Signage Market (2014-2019): Market Forecast by Display Technologies, Display Size, Media Player, Software, Applications and Regions.